Sri Chendalankara Sampath Kumara Ramanuja Jeeyar is a Sri Vaishnava sannyasi and the pontiff of the Mannargudi Chendalakara Shenbaka Mannar Matha. Pontiffs of Sri Vaishnava Mathas are referred to by the title ‘Jeeyar Swamigal’. Jeeyar Swamigal is popularly known as the Mannargudi Jeeyar, after the town the Matah operates out of. The line of succession at the Mannargudi Matha was broken and the pontiffhood was vacant for 125 years before the current seer was ordained. In his pontiffhood, along with his regular religious and cultural duties, the Mannargudi Jeeyar has taken it upon himself to reach out to Dalit communities and the most marginalized groups such as the Arundhatiyar, who very often live in segregated colonies in villages. Many of them are landless and work as casual labourers in agriculture and small industries. A good number are also employed in traditional occupations of public conservancy, leather and in cremation grounds. Another cause dear to the Mannargudi Jeeyar is that of cow protection. The Matha runs a goshala taking care of 51 cows under his supervision. The Mannargudi Jeeyar frequently visits colonies of marginalized Dalit communities. He conducts Lakshmi Pujas there and makes it a point to interact with children and visit homes in the colonies. He has given Pancha Samskaram – an initiation into the Sri Vaishnava community for lay worshippers – to hundreds of people, including people from the most marginalized Dalit communities. He openly speaks against conversion activities by other religions and insists on Hindu unity. During the floods in 2015, the Matha under the direct supervision of the Jeer engaged in rescue and relief mission in Cuddalore, one of the worst affected districts. It has been documented that natural calamities are seen by proselytisers as an opportunity to find new converts. A case in point is the 2004 Boxing Day tsunami, after which many coastal communities in Tamil Nadu saw many new converts. A Bhadrakali Amman temple in Kallimedu village, Nagapattinam District had some dispute regarding offering of mandagapadi (custom where the village deity visits streets/homes in the village). It remained deadlocked for years. Some elements tried to escalate this into a Dalit-Caste Hindu clash and tried to get the Dalits of the village to convert. The Mannargudi Jeeyar visited the village, called all communities to the temple, performed a Lakshmi Homam and reiterated the need for Hindus to stay united. Interesting aside – the English language media chose only to highlight the conflict and escalation, but chose to ignore the resolution brought about by the Mannargudi Jeeyar. Political parties that view Dalits as vote banks and that would view any outreach by Hindu leaders as an attempt to cut into their influence among Dalit communities. They have been looking to get back at Jeeyar Swami for long, and finally they got one thanks to the ‘cow vigilantes’ narrative being pushed by the media. Recently, Mannargudi Jeeyar was attacked by violent mobs of Islamist and communist elements. It is fast being twisted into a case of gau-raksha vigilantism. It is our intention to place the facts before the public before the event is beamed through Mainstream Media’s ‘reality distortion lens’. On June 29th, the Mannargudi Jeeyar was travelling near Palani in Tamil Nadu when he saw cattle being transported in cramped conditions. He brought the van to the Palani police station and lodged a complaint demanding that the transport be carried out in conditions fulfilling norms of the Prevention of Cruelty to Animals Act. Members of Communist organizations, Islamic organizations and the Viduthalai Chiruthaigal Katchi (VCK – an electoral party that claims to be Dalitist, Periyarist and crusading for Dalit human rights) arrived at the police station and started protesting. Even the left-leaning newspaper The Hindu has reported this incident without the usual distortion (screenshot). Fearing for the Mannargudi Jeeyar and his entourage’s safety, the police took them into the station premises. (Tamil report in leading daily, Dina Thanthi). In the meantime, activists from the Shiv Sena and RSS also arrived at the police station. Appropriate transport was arranged for the cattle. However, the group of Islamist, Communist and VCK cadre are reported to have indulged in stone throwing, because of which Ashok, a Shiv Sena activist, was injured. The first step in the distortion began with a reference in a recent Frontline long-form essay. This was unattributed and the Mannargudi Jeeyar is left unnamed, since the essay appears too soon after the incident. Clearly the intention is to pave the way for a later full-fledged distortion. The first steps were then made by VCK cadres on social media. A complaint requesting appropriate transportation for cows has been twisted into an attempt at ‘disrupting communal harmony’. The Facebook page of this particular individual claiming allegiance to the VCK reveals some interesting information about his views on the Indian State and he has also posted inflammatory content on the anniversary of Burhan Wani’s 1st ‘death anniversary’. Once the distortion was spread on the social media by hateful groups, it has now been picked up by the allied elements in the mainstream media. India Today has published a report out of Chennai, labelling the Mannargudi Jeeyar as a ‘self-acclaimed godman’ and mis-representing his complaint. 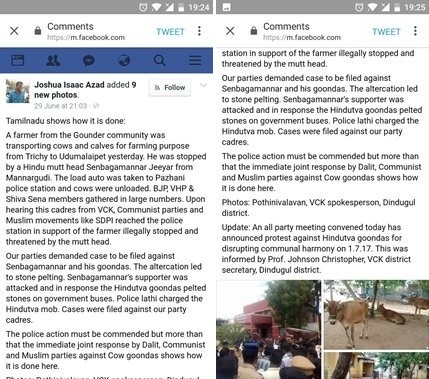 Notably, they mis-represent the people opposing the Mannargudi Jeeyar’s complaint as cattle transporters’ even though it is clear that they are cadres from VCK and Islamist organisations. This is obviously filed by reporters who only had second-hand information about the incident. 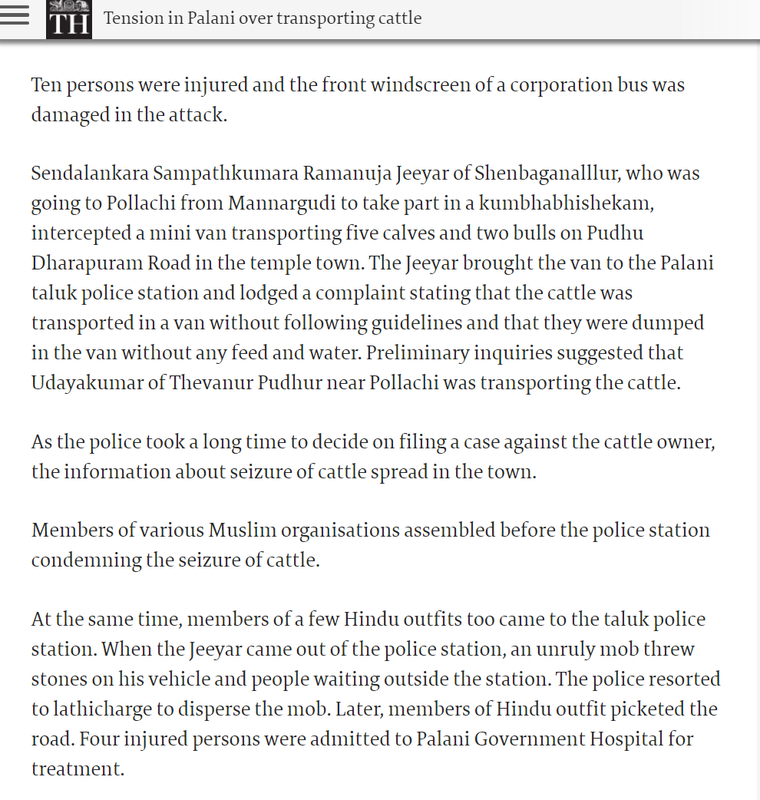 A Hindustan Times report is relatively less negatively disposed towards the Mannargudi Jeeyar, but it still does not identify the persons injured in the stone pelting. While The Hindu and Dina Thanthi are news outlets with presence on the ground in Dindigul, where the incident occurred, one wonders what the sources of India Today and Hindustan Times reports were. And one fears what else is there in the future. It is clear that Mannargudi Jeeyar is being targeted mainly for his activities like his outreach to the Dalit community. Elements in the English language media have many times openly declared that they should focus on caste fault-lines, especially around Dalits, to defeat what they brand as ‘Hindutva’. Anyone trying to work towards eliminating these fault-lines risk being seen as people who are denying them an opportunity to defeat Hindutva, and perhaps Mannargudi Jeeyar Swami is being punished for this.